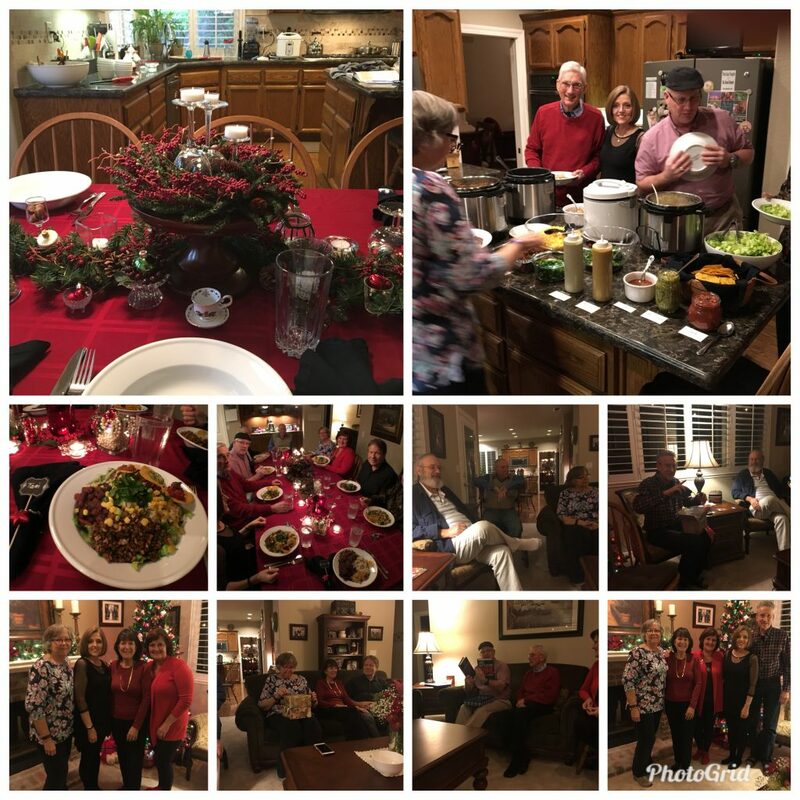 Entertaining can be stressful – there are so many decisions to be made and when you transition to a whole food plant based diet and you have no idea what to serve to company! Does this resonate with anyone? I have been eating a WFPB (whole food plant based diet) for 4 1/2 years and for the past 2 1/2 years it has been oil, salt and sugar free. Yet, we still entertain and have company over and no, not everyone who eats here is plant based. It is quite easy to pull this off with just a little planning. So let’s get started! We are so blessed to have a local WFPB registered dietitian – Timaree Hagenburger who is also a college professor and a cookbook author. 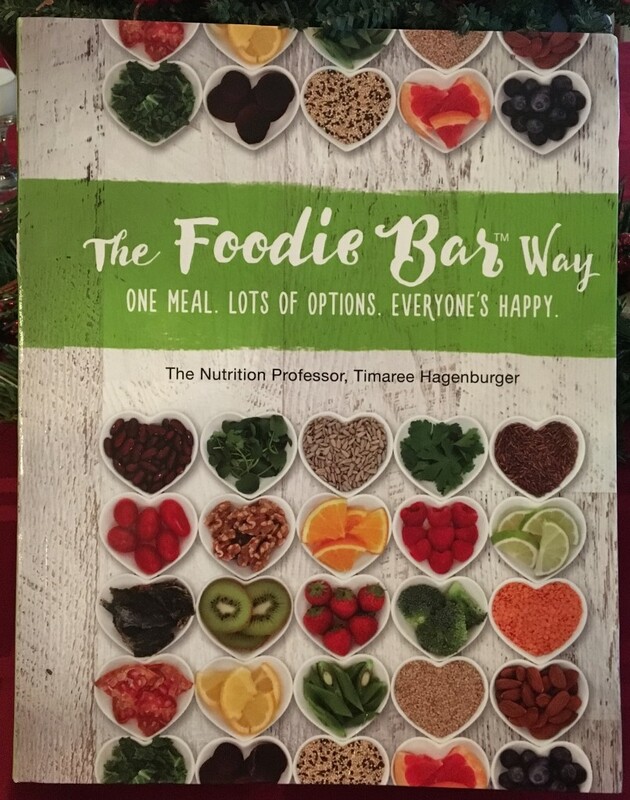 “The Foodie Bar Way ” by Timaree Hagenburger is the solution to so many of our entertaining quandaries as well as how to feed and please the entire family on a daily basis! It boils down to this, instead of making everything and serving a completed entree, you prep, cook and display the ingredients to assemble an entree so that each person can customize their own plate according to their palette. As you all know I am the queen of batch cooking and this is pretty much the concept that I already follow. If the fridge is stocked with prepped ingredients Tom and I can assemble a different flavor profile using the same basic ingredients over the course of the week. Simply adding a different herb, sauce, flavored vinegar or salad dressing gives you a new flavor. What the Foodie Bar Way provides are the ideas, both basic ideas where very little cooking skills or prep is required to raising the bar recipes that require a few more ingredients and a little more time to pull it all together. These ideas and recipes are perfect for feeding the family on a daily basis or you got it – entertaining guests. When you choose a theme for the buffet/potluck you don’t end up with too many desserts and not enough entree dishes. It limits over eating as well because many of us feel compelled to try a little of everything at a buffet especially if its all plant based recipes. This way you do get to try a little of it all but all of the dishes displayed are part of the completed entree you get to assemble. Win win! There are two things that I get the most request for – a no oil creamy salad dressing and what to serve company – especially omnivores! If you haven’t yet tried my Creamy Balsamic Dressing you are missing out! It has become one of the most popular recipes on my blog. You can see how this concept of setting out prepped ingredients lends itself quite well to a buffet/pot luck gathering. This is just a more organized way of having a pot luck. The hostess can decide which “Foodie Bar” she wants to entertain with. 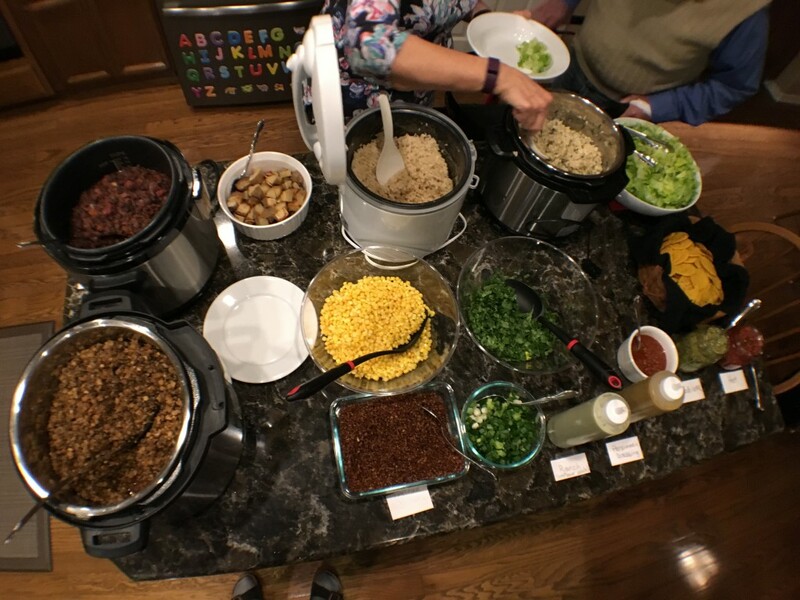 There are many to choose from such as a Potato Bar, Pasta Bar (for gluten free, flour free use zucchini noodles), nacho bar – (for gluten free – flour free use home made tortilla chips made from corn tortillas baked of air fried or use cooked sweet potato slices), Crazy Salad Bar, or one of my favorites a Burrito Bowl Bar. It seems like everyone we know enjoys Mexican food. Once you decide on the “Foodie Bar” theme you make a list of ingredients/recipes that you want to have. For this particular occasion I chose the following items; Seasoned Black Beans*, Cilantro Lime Brown Rice*, plain brown rice, corn, Mexican Quinoa*, air fried potatoes, green onions, cilantro, Salsa Verde, Tami’s Easy Red Salsa, Dehydrated Corn Chips, Cauliflower Lentil Filling*, romaine lettuce and Donna’s Cheeze Sauce. For dessert I made Chef AJ’s CRAM Muffins (recipe is in one of her webinars that you can purchase) to go with the fruit salad Lorna brought. The items marked with * are recipes from The Foodie Bar Way cookbook. You can purchase the cookbook or use your favorite recipes for black beans, Mexican rice and or quinoa. I will make a blog post showing how to make the dehydrated corn crackers in the coming weeks. For those of you who are in Chef AJ’s Ultimate Weight Loss program you need to know that this book is oil free, whole food plant based and some of the recipes do use nuts, seeds or whole grain products like pasta, whole wheat tortillas and some higher fat foods like avocado. Of course I adjust the recipes to suit my needs and skip the ones that I can’t modify. Even so this cookbook contains enough recipes that I can use and it’s been a very nice addition to my cookbook collection. The entertaining ideas alone make it worth while to own. Here is the fun part of hosting a set menu Foodie Bar Buffet. You can use a free website called Sign Up where you post all the details about your gathering, list all the ingredients that need to be brought with details about quantities and so forth and you send out an email from the site to all the guests. The recipients get a link to sign up to bring the requested items. The host gets to view who is bringing what. It’s a wonderful system for keeping organized and on top of the guest list and who signed up for each item. You can always email people specific recipes if they don’t have their own to draw from. I can’t share all of the recipes from The Foodie Bar Way – you will need to purchase the book for them, but I will link to the one the author has posted on her website. 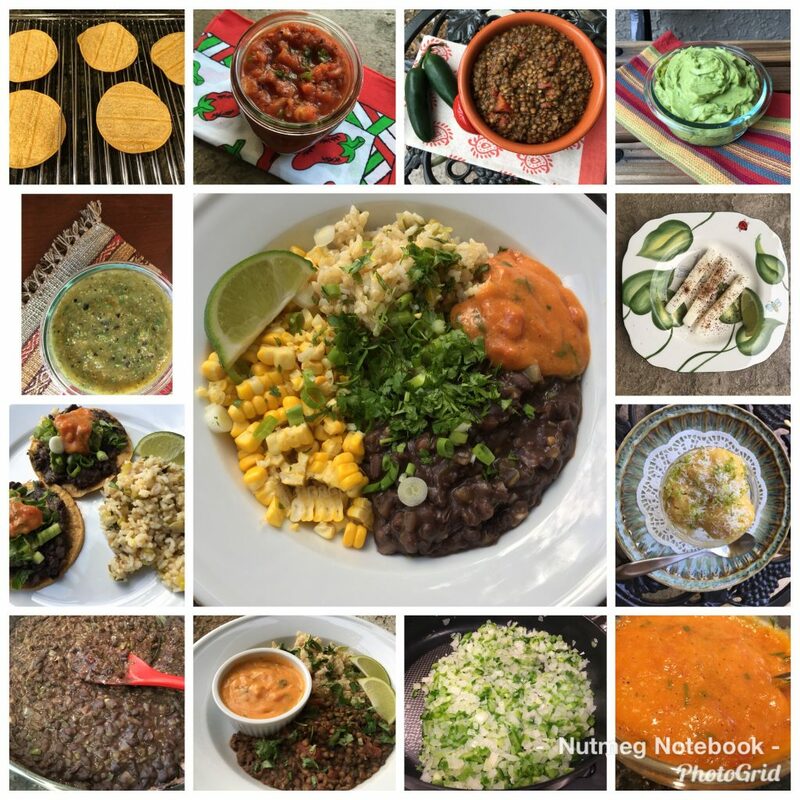 Also I can share some of my favorite Mexican recipes with you that will work for a Burrito Bowl Buffet. For dessert you can make a fresh fruit salad, banana nice cream – frozen bananas pureed in a high powered blender – we like a banana -mango combo the best or make the How Sweet It Is dessert that is a crowd pleaser. Plant based eaters as well as most omnivores will enjoy this buffet. Of course we all know someone who will feel the need to say “wheres the protein?” Everyone will walk away full and satisfied! It’s a good idea to label the buffet food so everyone knows what it is. What a treat it is to be able to take a taste of everything on a whole food plant based buffet! 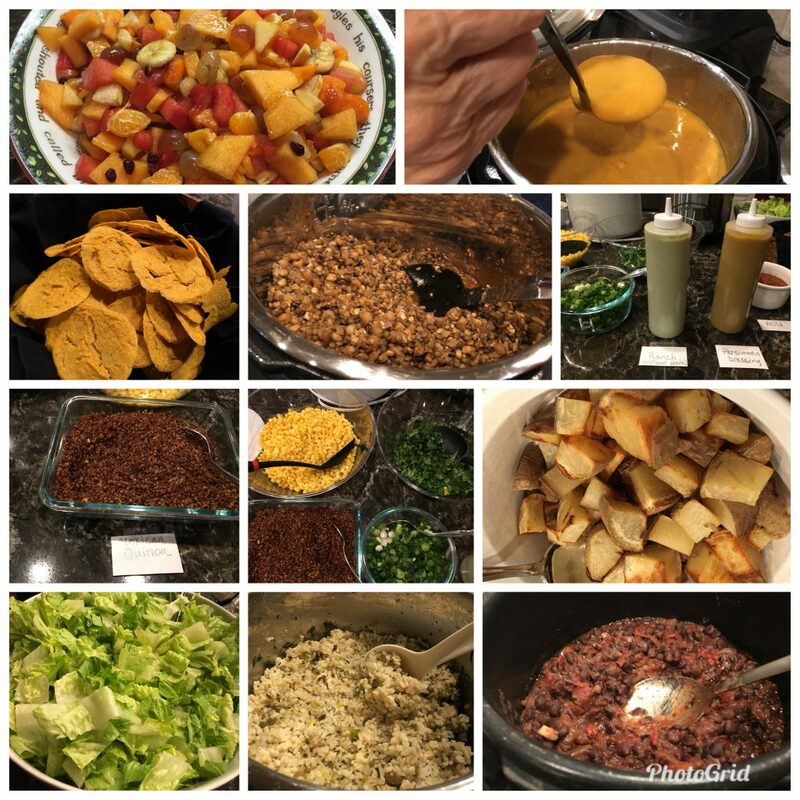 If you would like to watch me make all the ingredients for a fabulous Burrito Bowl Buffet I have a Mexican Fiesta Cooking Webinar that you can purchase for $9.95 that includes some recipes that are exclusive to the webinar and not available on my blog. You get all 10 recipes in a downloadable PDF. It will help you to easily make the dishes shown in the photo above and will delight your family and friends! 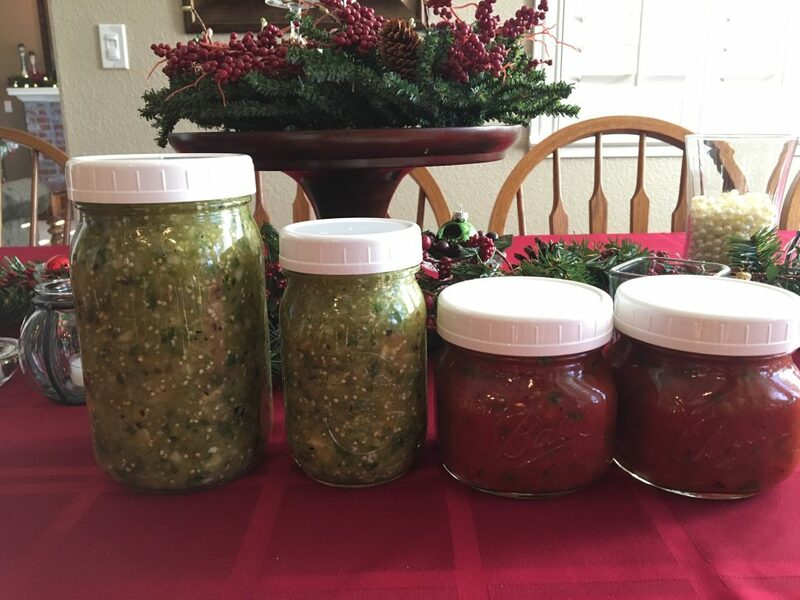 It can be purchased here Mexican Fiesta Cooking Webinar. 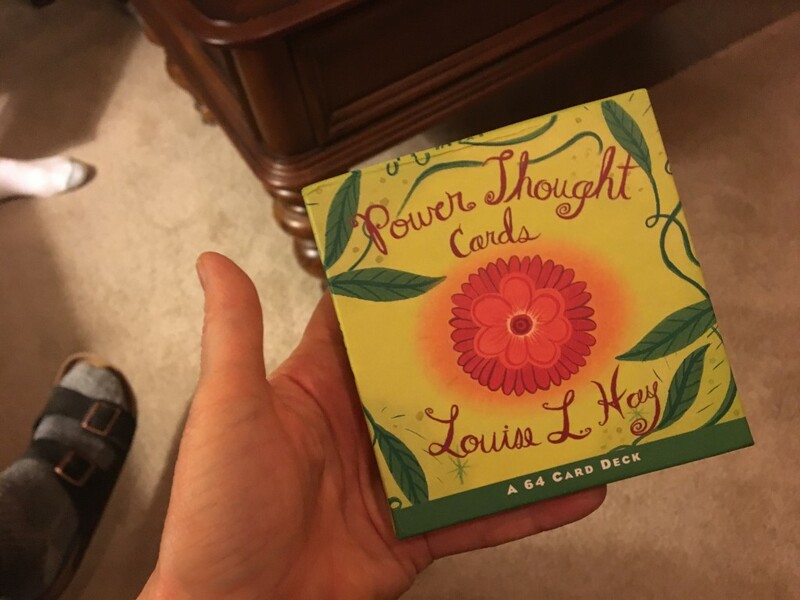 We had a gift exchange and I got these Power Thought Cards by Louise L. Hay. I love them, each day you can look at an inspirational card that has positive affirmations and good thoughts to start your day! I hope you all enjoyed a lovely holiday weekend. We were very busy enjoying time spent with good friends and our loving family. As we gear up for the New Year it’s a wonderful time to reflect on my health and what goals I want to set for 2018. I am always striving to become physically and mentally stronger and healthier, to learn new things and to have new experiences. I will challenge myself to do more of all of these things in the year ahead. I have learned that it’s okay to let go of traditions and events that no longer serve my healthy lifestyle. Sometimes you even have to let go of old relationships that no longer support your lifestyle choices. There is a saying that we are the sum of the five people that we spend the most time with. I am fortunate to say that the five people I spend the most time with are like minded spirits! Even though I have been eating WFPB for 4 1/2 years and I have been eating SOS free (salt, oil, sugar) for almost 3 years I am still learning about plant based nutrition and exercise. We never truly arrive at a certain destination even after we achieve a healthy weight. There is always more to learn and ways to grow. Passing forward the life saving information about following a whole food plant based lifestyle is a mission that Tom and I want to become more involved in. We plan on making more You Tube videos and to blog more consistently in the months to come. If you haven’t subscribed to my You Tube channel please do so you won’t miss out on any new videos. I am also active on Instagram and my Nutmeg Notebook Facebook page so be sure to follow me there as well. If you want to help inform people about the benefits of a whole food plant based lifestyle be sure to share the You Tube videos, blog posts and facebook posts that myself and others provide. Once people learn about the science behind this lifestyle they are more likely to give it a try. It will take a grass roots effort to make the information more widely available. There is no money to be made by big corporations if everyone starts eating healthy and no longer need to support the prescription drug companies or purchase processed food! I have a new feature if you click on the Shop tab at the top of this page you will find a link to my Amazon Product Recommendations! By purchasing items through my links you help support this blog with no additional cost to you. Thank you for your support. I should receive the book today! Your blog has been making my life a whole lot easier. The way you present the food with your pictures get me every time. I love it! I also enjoy everything your write. I know it is work but you and Tom are doing a fabulous job! Tami, Your Nutmeg Notebook is a GIFT to the world! You are making such a positive impact! I am so glad that The Foodie Bar Way resonates with you! Thank you Tammi – Merry Christmas!???. Can’t wait to try the crackers soon. Thanks for this post- I will definitely check our the book but wanted to let you know I did the fajita bowl bar for mixed vegan/non-vegan company. Everyone loved it and ate their veggies. So nice to stay compliant while serving guests. I am so happy to know your Fajita Bowl Bar was a huge success! People really don’t miss the animal products when we present them with such a beautiful array of healthy food. Thank you so much for taking the time to come back and let me know it worked for you.